Anambra Guber: Desecration Of The House Of God, Who Is To Blame? Though Okadigbo's position leans more to the school of thought that views a mix of religion and politics as toxic, his recognition of the importance of caring for the souls and businesses of governance in a society, indirectly he reinforces the importance of a partnership between clerics and politicians. “In many ways religion is safer at home and politics in the public domains. However, due to the variance of political view and the hunger for political power, Nigerian politicians have carried their blatant disrespect for God and godly behavior to Prayer Camps, Adoration Grounds and Redemption Camps where they constantly desecrate the hallowed environment. Many prayer camps abound in Nigeria including Alone with God Prayer Camp, Abuja, Scripture Union Camp of Faith Okigwe which serves clerics cutting across denominations in the South East and South South. There is Adoration Ground in Emene, Enugu managed by Rev Fr Ejike Mbaka, Adoration Ground in Uke, Anambra State managed by Rev Fr Emmanuel Obinma popularly called ( Ebube Muonso), Upper Room Ministries of late Rev Fr Njoku in Emene, Enugu. Bishop Oyedepo manages Canaan Land, Pastor Kumuyi controls Deeper Life Camp Ground, Pastor Olukoya controls Mountain of Fire Prayer City, and Pastor Adeboye controls Redemption Camp all within Lagos- Shagamu expressway. These prayer camps were established to enable Christians seek the face of God in matters of holiness, dedication, repentance, prosperity, healing, deliverance and even national rebirth, and these aforementioned camps have some iota of presence of God in their activities. Furthermore, Redemption Camp is the biggest prayer camp in Africa. There is no doubt for any spiritually discerning observer that the Redemption Camp carries some doses of the Presence of God especially during Holy Ghost Congress, Holy Ghost Service etc. Many Nigerians throng to the camp to seek a conducive environment to communicate with God away from the distractions of city life and busy schedule. The same environment had also attracted many troubled politicians including former president Obasanjo who ran to the place when Pastor Tunde Bakare prophesied that his Ota born head will be severed by Nigerian coup plotters before May 1999 in a widely reported controversial prophecy. Reports have it that he also visited the camp later on in his presidency. In addition to the above, this Redeemed Camp has been troubled by those who troubles Nigerians including looters of public treasury, riggers of elections, political liars, economic kidnappers and perpetrators of social and political injustice. They also come tacitly to seek the face of God to continue with their acts of evil against the Nigerians. Their activities would have gone unnoticed until Nigeria's President Jonathans went to the camp and knelt before Pastor Adeboye in show of strange humility in December 2010 meant to achieve electoral advantage. At the end of the day, many Christians voted for Jonathan because he knelt before Baba Adeboye. Two years later, when his popularity dwindled due to draconian economic policies, mountain corruption and removal of fuel subsidy, Nigeria's President Jonathan ran to the Camp again, mounted the podium and reeled lies and deceits that he has not made up his mind to re-contest for re-election in 2015, when his close friends have already told many Nigerians that nothing will stop their man in 2015. Barely three weeks after his speech at the Redeemed Camp, he was fingered in the mayhem on his Rivers State kinsman, Rotimi Amaechi, and his supporters for daring to have interest in the same presidency he is 'YET' to decide on. Today, Anambra state governor Mr. Peter Obi and Former Anambra state governor Dr. C.N Ngige are throwing allegations and counter-allegation on themselves due to what took place Holy Ghost Adoration Ground, Uke, in Anambra State is another popular camp which receives hordes of visitors. Campaign Train, fully dressed in Campaign uniforms and started asking for support for APGA after making a total of N15 million donations to the church, and making a promise to construct the road to the Adoration Ground and send 20 Pilgrims to the Holy Land, Israel. The Priest said he had to accord him that respect as the Governor and deeply regretted the Stampede that happened that day too. 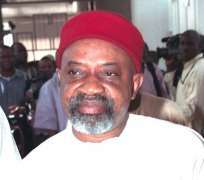 The Priest said that though the Worshipers were shouting Onwa, Onwa when the Governor wanted to speak, there were no APC thugs wearing uniforms and waving brooms among the crowd, adding that if there were, the cameras would have captured them and therefore wrong to blame the deaths caused by the stampede on Ngige Supporters. It was in Anambra state where God is being solicited to deliver the people from kidnappers, robbers, unemployment, diseases etc. Governor Peter Obi of Anambra State, APGA Party Chairman, Victor Umeh, and APGA Gubernatorial Flag bearer, Willy Obiano, among others, invaded the solemn arena, instead of the meekly seek God's grace and intervention for the state, they desperately turned it into a campaign arena where they wanted to woo some of the adherents of the prayer ground, as if they are only politicians knowing the road leading to churches. Unlike the Redemption Camp where the worshipers were excited that President Jonathan knelt before their General Overseer, the Adoration worshipers where not impressed with the presence of Governor Peter Obi in their hallowed ground. They booed, jeered, murmured and hissed as he spoke to them. They detested any political presence while they are trying to locate God. Governor Obi and his team later knelt down for prayers the same manner Jonathan knelt before Adeboye yet the worshipers were not impressed. By the time the governor and his team of politicians left, they have desecrated the place so much that death soon followed in their trails. As Anambra state governorship election is on our door step, I see Gov. Obi's desperate move and his appetite for a successor as a veritable bugaboo which must be pooh poohed, by all cosmopetis Homo sapiens. Recall that thirty Five Roman Catholics, under the Pontificate of poor people loving Pope Francis were trampled by agents of wealthy, looting politicians because they went to seek God in a prayer Camp. This is because politicians have desecrated prayer grounds sometimes with the connivance of the clerics while in some other cases they used and dumped the clerics without their knowledge. In the case of Redeemed Camp, nobody died physically, but many RCCG fans constantly die emotionally, politically, psychologically whenever occult, corrupt, looting, insensitive and wicked politicians are given undue attention in the place. After the 2012 political campaign at the Redemption Camp, one of Adeboye's pastors, Bankole, a lawyer and human rights activist resigned from the pastorate in protest over the desecration of the Camp hallowed Podium by corrupt politicians. The Uke tragedy is a divine sign that 'whosoever breaks the hedge, the serpent will bite'. Whatsoever caused their death; this is the first time death is being recorded on that ground. These politicians have desecrated the holy ground at Uke, and instead of apologizing, they are playing politics with it. The clergy cannot avoid the blame for whatsoever happens in that Camp. Everyone has the right to visit prayer camps and worship center. While in such camps, he or she should be in prayer mood like other worshipers, and apart from official protocols of recognition, they might, at most, be only allowed to greet the church and should be more involved in repenting of their acts of mal-governance which they visited on defenseless Nigerians, instead of hypocritical sermonization and political campaigning in the house of God. Finally, Nigerian politicians should not forget that the house of God is a place of prayer and thanksgiving. Though their visiting have not in any way reduced their trails of looting, thieving, lying, murder, assassinations, kidnapping and insensitivity, and social ills. The clerics should remember that they are going to give account of how they manage their worshipers not how much you made or how gigantic your worship was. There is an urgent need to all defiled house of God to pray for the restoration of the glory of God in the temple and to revive it spiritual places of succor. This is the time because tomorrow will be too late. Disclaimer: "The views/contents expressed in this article are the sole responsibility of Ihemelu Okey and do not necessarily reflect those of The Nigerian Voice. The Nigerian Voice will not be responsible or liable for any inaccurate or incorrect statements contained in this article."